To all my fellow friends Teacher from Tamparuli Sabah, Happy Teacher Day 2011. Keep Up The Good Works and GBU All.... From Tamparuli Sabah Admin. 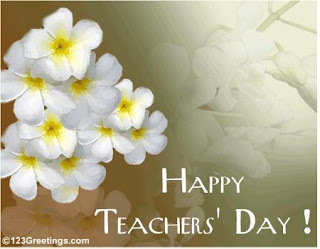 Each year, the educators will celebrate Teachers' Day celebration on 16 May At this year's Teachers' Day would be celebrated even more preformance in the past 2 months, the teachers know the theme Generator for Transforming of Education In Malaysia. If viewed in this theme is smooth, then see clearly that teachers increasingly challenging task. Because the engine of transformation (change) education, educators should bear all the education plan has been designed by the government. In other words, any plan that has been planned by the government as policy makers have done so perfectly for what is implied in the Teachers' Day theme this year is achievable. Exercise KSSR, FIES and MBMMBI should mold set by the government for the desired transformation of education can be achieved. Similarly, the use of IT (information technology) and ICT (information and communication technologies), educators must master for the objective of transforming Malaysian education to be achieved. In this case, self-esteem should be higher for the teachers to the rhythm that is designed by the government in education. But in this case (the transformation of education), I believe the teacher was already prepared.